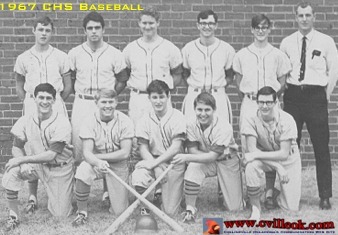 1967 CHS Baseball Team -- (L-R) Back Row: Ron Killingsworth, Fred Roten, Jerry Hughes, Dave Rose, J.H. Middleton and Coach Gary Ward (later Coach at OSU). Front Row: Steve Williams, Scott Murphy, Donnie Larimore, James Burwell, and Steve Fulton. 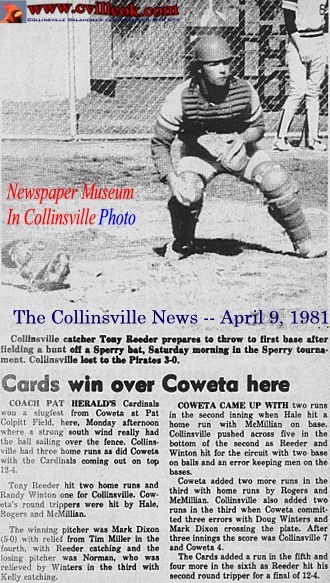 Bring you baseball gear, talent, and linament and join the Collinsville Cardinal Homerun Club on the CHS baseball field at 2:00 p.m.
during his playing days for CHS. 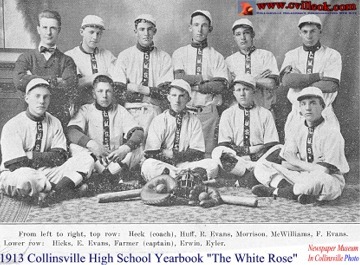 1913 CHS BaseBall Team -- (L-R) Top Row: Coach Oscar Heck, Huff, Russell Evans, Isaac Morrison, McWilliams, and Frank Evans. Lower Row: Hicks, Everette Evans, Clifford Farmer and Erwin Eyler.